Liberté, égalité, fraternité – Happy Bastille Day! In honor of Bastille Day, I am posting my Huffington Post piece on Autism and Education in France published on June 14, 2010 (one month ago). France is moving slowly, but at least forward, to have Liberté, égalité, fraternité for children and adults with autism in France. Recently I was invited to Paris to present at a prestigious international colloquium on autism and education, which was organized by the INS HEA, the French Ministry of Education’s training institute for special education teachers. Seventeen years earlier, I had left France because in those days, children with autism did not have the right to an education, and my son, Jeremy, was severely impacted by autism. It was an emotional moment for me, standing there, addressing 500 attendees in a lecture hall of the Universite Paris Descatres in Bolulogne – Billancourt, explaining my son’s educational experience in the United States, where all children have the right to a free and appropriate education under IDEA. In 1993, my family left France, where we had been living since 1981. Both Jeremy and his sister, Rebecca (who is neurotypical), were born in Paris at the time when children with autism were considered mentally ill, not developmentally disabled. They had no right to an education. Instead, they were enrolled in day programs on hospital sites, where they were treated with psychoanalysis. Parents had no right to visit the day program, nor did they receive any communication about what went on during the hours their child spent there. When Jeremy showed autistic tendencies, I was told by the powers that be to take him to see a psychoanalyst. The psychoanalyst concluded that Jeremy was autistic because he suffered separation issues from breast-feeding. This the analyst gleaned from watching him spin round objects (which reminded him of his mother’s breasts) and chase after one that he had “lost” when it fell and rolled under a piece of furniture. The French genetic specialist who handed me my son’s diagnosis, also handed me some advice. She told me to look for and find a good institution for Jeremy. I have — it’s called public school. On June 18th, both Jeremy and Rebecca will be graduating from high school. Jeremy will have taken seven years to do so, in comparison to Rebecca’s four. I am equally proud of both of them. I am not sharing this information to knock the French; I have heard similar stories in the UK and in the US: Parents seeking help were often blamed for their child’s autism and were given no hope and no answers. The big difference however, is that back then there were no French laws allowing children with autism to be educated; and now there are. Yes, the laws have changed in France, and now things are beginning to move slowly but surely. Not fast enough for all the families in need of an education for their child, but at least it is moving forward. 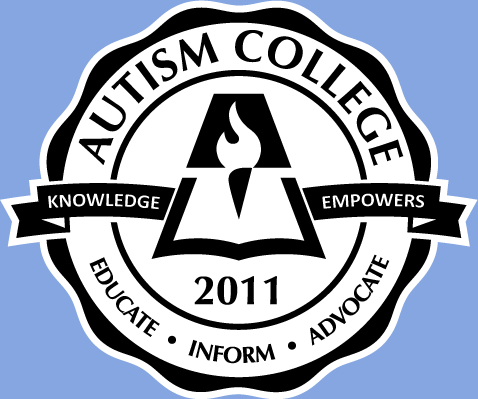 During the two day colloquium, there were presentations by teachers and other educators, parents, principals from different schools and different regions of France, sharing their successful experiences of how they were educating students with autism in their schools and classrooms. It was wonderful to hear the passion these people shared. We also heard presenters from Italy, Belgium, Sweden, Canada and Brazil. It was apparent that no matter what country or region, student success was based on the same foundation in all countries: parents who fight for the rights of their children, administrators who believe in these students and support their placement, trained staff who are enthusiastic and creative about teaching, good teamwork and communication between the school and the parents, and clear goals that are shared by all. I was surprised, and then I couldn’t help but laugh at the irony of it all. Notre Ecole was the only institution in Paris at the time 19 years ago that were accepting children with autism and were teaching them (using TEACCH), as opposed to just providing psychoanalysis. I had hoped to get Jeremy into Notre Ecole, but it had not been possible. Perhaps, if he had gotten into Notre Ecole, I would never have left France. I would not have written the books that I have, as it was my frustration that inspired me to write books in order to provide hope and information to save other parents a little grief. My son certainly would not be graduating from high school in a few days, if he had gotten into that school.